Spring water Kuracjusz Beskidzki is drawn from the deep water drilling which is located on the brow of the hill Jasień in Sucha Beskidzka. This town is situated in small, clean, beautiful and charming valley in the edge of Beskid Makowski and Beskid Małego. 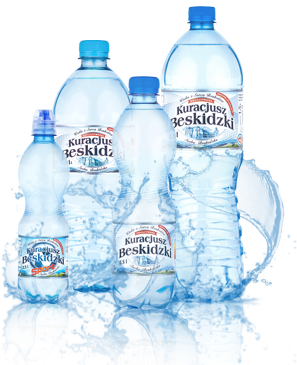 Thanks to unusual taste qualities and a proper mineralisation of the water Kuracjusz Beskidzki one can drink it without any restrictions. The water is under constant control by the panel of specialists who care for keeping up high standards during the production. In this way our products preserve the highest quality. Why is it worth to drink spring water Kuracjusz Beskidzki? We need water and we should take it in proper quantity during a day. It means somehow 1,5 liter. It is known that spring waters not only quench thirst but also give us minerale with healing properties. Drinking spring water Kuracjusz Beskidzki we gain more energy and also deliver our blood oxygen and other important nutrition elements for cells in our body. When we add water to our body it reduces stress and helps whilst doing physical exercise which protects us for muscle contractions. Everyone should also know that drinking water in large amounts allows to speed up our metabolism, improves digestion and nurtures skin. Thanks to these our body looks younger. Kuracjusz Beskidzki will provide you necessary minerale. That helps you to nourish and clean your body. You can also refresh and rejuvenate your skin. What is the most important you can improve your concentration and comfort. When you drink water Kuracjusz Beskidzki you are sure that sou hale chosen product of the highest quality!